Morris “Dutch” Corthell was a Laramie resident who played football at the University of Wyoming. Corthell also loved horses! 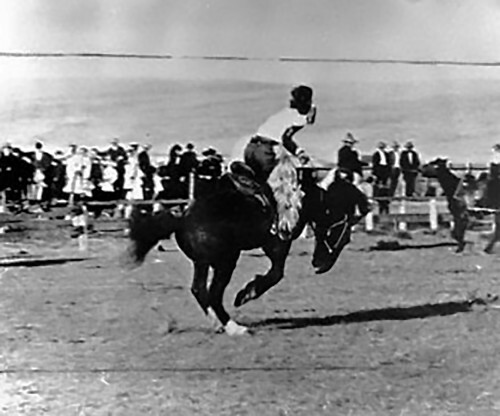 In 1910, having never ridden a bronc before, he got his chance to ride on the legendary Steamboat at Cheyenne Frontier Days — and stayed on throughout the entire ride!. Dutch completed his education at the University of Wyoming and became a prominent lawyer in Laramie involved in the protection and development of water rights in the Laramie Valley. Learn more about Dutch Corthell, Steamboat and the Wyoming State Quarter.